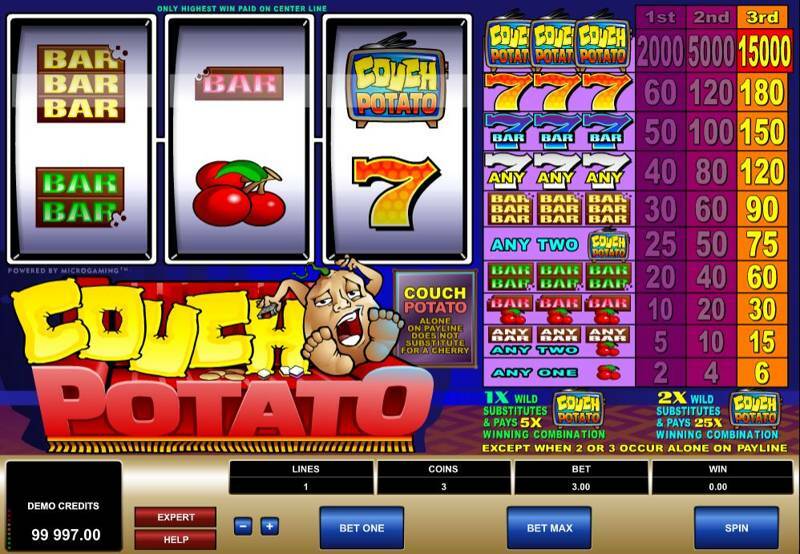 The Couch Potato is a real look back down memory lane to what slots used to be like. If you’ve ever seen a movie with people playing slots in Vegas, then this nostalgic slot could right up your street. What we will say right away is that this slot doesn’t have a whole host of features like the majority of the modern day games. It is simplicity personified. You get three reels and one payline, and everything is in one place showing you what you need in order to win. The theme is really based around diamonds and the now legendary three lucky 7’s. These are your bigger paying pay-outs. The symbols are as retro as you’re going to find: red cherries, single double and triple layered Bar’s and two types of lucky 7’s, one red and one diamond encrusted. It’s all about matching up your symbols with this game and that is pretty much the top and bottom of it. 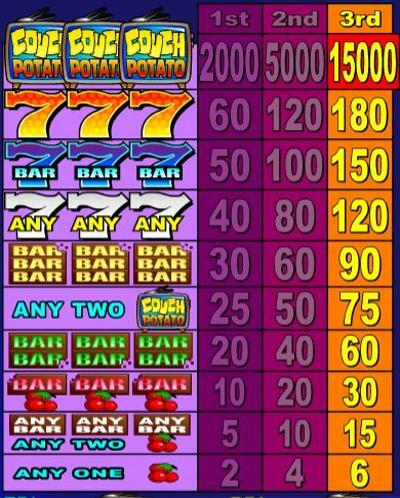 People often say that this slot is for the beginners as it’s so simple to play, and whilst this argument does hold some weight, we think it’s a little insulting. It’s certainly not designed towards people who are looking for loads of in-game features like bonus rounds, free spins or expanding wilds; but these old school slots are a dying breed in this industry so this retro offering is still welcome in our eyes. The design is great, the music is great, the gameplay is great and even the rewards are more than adequate. Look out for the TV showing the name of the slot as this is the games Wild symbol. Landing one will bag you 5x the winning combination, but if you land 2 that will boost your winnings 25x. 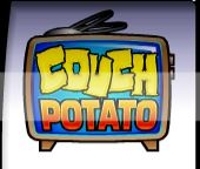 That lazy couch potato might be good for something after all. A really great addition in terms of design is the inclusion of the pay chart running down the side of the slot, which means you can instantly see which symbols give you what return. There are three pay tables to choose from, each requiring more than the other to set your spin away. Table 1 requires just 1 coin, table 2 two coins and table three 3 coins. The jackpot comes at the top of table three where you can win 2,500 coins for collecting three of the diamond incrusted lucky 7’s. The same outcome on tables one and two return 500 and 1000 coins respectively.